During November and December 2014, morphologic anomalies were observed in 11 stillborn calves from two farms in the Grootfontein and Otavi districts in the north-eastern region of Namibia. These calves showed a variety of malformations, including arthrogryposis, abnormal curvature of the vertebral column, ankylosis of joints and severe muscle atrophy. Blood samples were collected from 9 of the 11 cows that delivered stillborn and malformed calves. Separated sera were stored at -20°C and sent to Istituto Zooprofilattico Sperimentale dell'Abruzzo e del Molise in Italy for serological investigations. Serological screening for SBV was performed using the ID Screen® Schmallenberg virus Competition Multi-species ELISA (ID-vet, Grabels, France) according to manufacturer's instructions, whereas the serum neutralisation test was performed using the BH80/11-4 isolate (provided by the Friedrich-Loeffler-Institut, Isle of Riems, Germany). Antibody detection for bluetongue virus (BTV) was performed using the competitive ELISA described by Lelli et al. (2013). 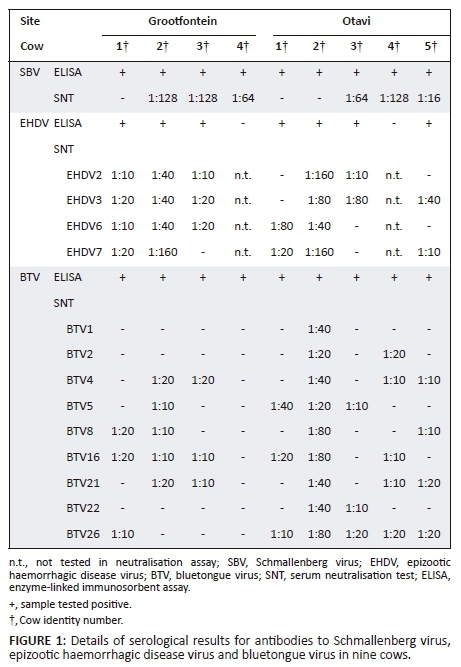 A commercially available competitive ELISA kit (LSIVettm Ruminant EHDV - Serum, Life Technologies, Carlsbad, CA, USA) was chosen to test for antibodies against epizootic haemorrhagic disease virus (EHDV) according to the manufacturer's instructions, while the serum neutralisation test for BTV and EHDV was performed using the method described by Gard and Kirkland (1993). The authors thank the Istituto Zooprofilattico Sperimentale dell'Abruzzo e del Molise 'G. Caporale', which is supported by the Italian Ministry of Health, for covering the expenses for the diagnostic tests.